The images were digitally created with Adobe Photoshop software. Photographs with the appropriate expression and angle have been used for the hands and faces. 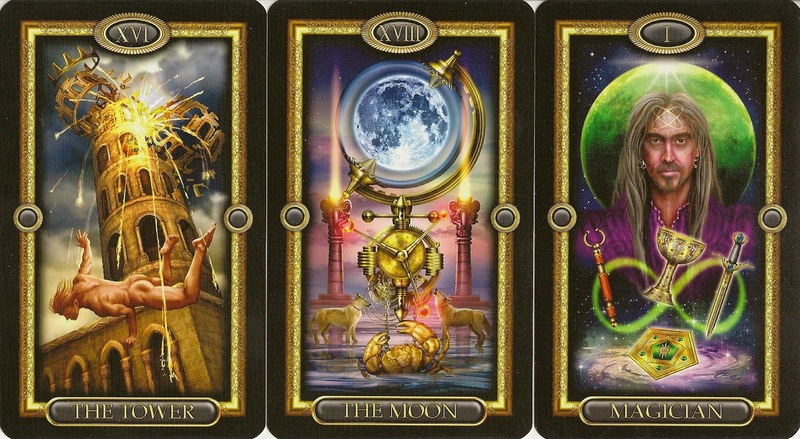 The major arcana cards are traditionally named except the Hanged Man, who is renamed the Hanging Man. 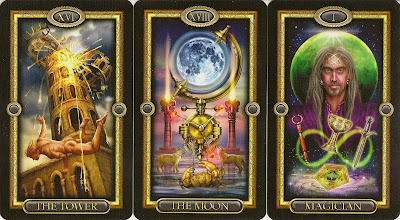 The Fool looks a bit like George W. Bush, the Majors are archetypes of traditional tarot decks . The Minors are fully illustrated and follow, fairly closely, the original designs of Pamela Coleman-Smith. While the emblem of the Sword, in the Suit of Swords, and the emblem of the Cup in the Suit of Cups, remain constant in the manner of their appearance from one card to the next in each of the two suits, the emblem of the Wand as used in the suit of Wands, and the emblem of the Pentacle, as used in the suit of Pentacles, go through various transformations as seen in the various cards of the respective suits. Thus, the Wand appears as scepter, fighting staff, walking staff, column and knights lance appropriate to the meaning of the particular card. 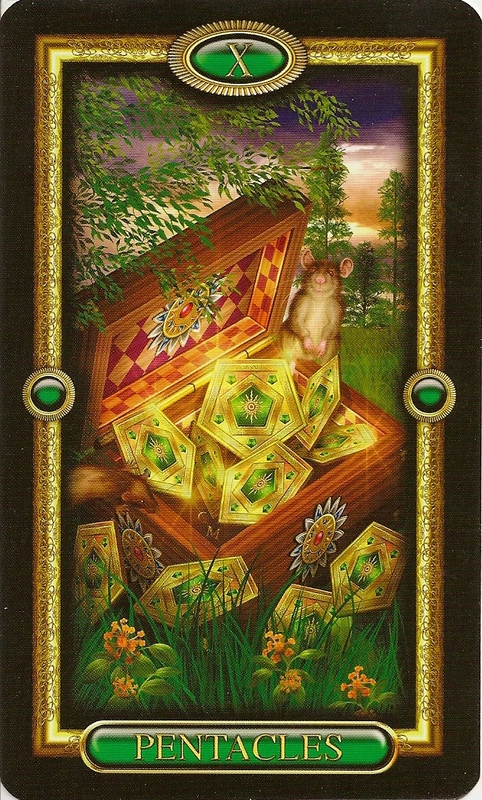 Similarly, the Pentacle in the suit of Pentacles is, at once, Knights shield, a structural part of a Kings throne, a treasure chest of coins and various other constructs. The cards of the Gilded Tarot Royale are larger (84 mm x 140 mm) than those of the Gilded Tarot (70 mm x 117 mm), the card stock is thicker with a gloss finish and edged in metallic gold. The images of each card have re painted and more animals have been added to the deck. The deck includes an additional signature card. The backs are reversible and show a jeweled sunburst above a blue shield held in place with golden vines. The deck comes with a CD rather than a booklet. 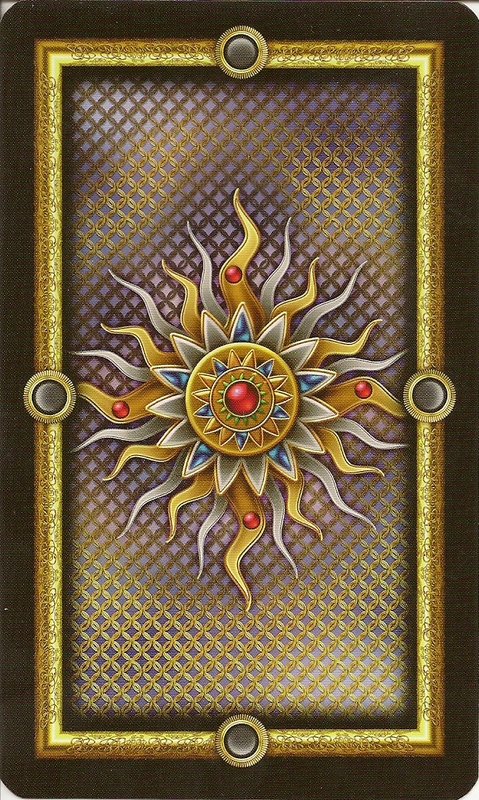 Screensavers, avatars, diary templates, and a PDF with information about the cards is contained within.